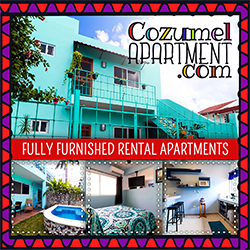 Cozumel 4 You is your source of local events and activities information for things to do in Cozumel, Mexico. Please keep in mind that the dates of events often change year to year, and while we do our best to keep the Cozumel Calendar current, you might also want to contact us or check in our Cozumel 4 You Facebook group for up to the minute information. Not only is this event tied to many charitable organizations that help children, however, it’s a great time to eat “rosca de reyes” which is a delicious coffee cake that all local bakeries produce around this time of year. Baked inside each “rosca” are small babies. Anyone who gets one of these in their slice of cake, must have a party on February 2nd for everyone present. Most people think of Carnaval as just a three day parade and party, however, for island residents, sometimes the events leading up the actual parade can be even more fun. There’s an election of king and queen, a ladies’ event, concerts and even a pet contest. The dates of these events changes yearly, however schedules are posted far enough in advance so you won’t miss out on any of the fun! This is a national holiday, with speeches and ceremonies. This was just started in 2010, however, it was such a success that it’s now planned to be a yearly event. Anyone can enter. National Holiday honoring president and leader of the 19th-Century Reform movement. The Hawksbill (or Carey) turtle egg laying season begins in May in Cozumel. During this Cozumel nesting season, the City works in co-ordination with local police and Federal armed forces to limit activity on the east side at nights during turtle nesting season. This is one of Cozumel’s oldest traditions, dating back more than 150 years, and originally commemorated the first catholic mass in Mexico, which was celebrated in El Cedral. During the First week of May, the town of Cedral abounds with food stands, games, dancing and shopping. There’s also exhibitions, races, bullfighting and other events. The Sacred Mayan Passage also takes places at the end of May. 26-foot canoes, crewed by 4 – 6 participants, will travel from Xcaret on the mainland, to the island of Cozumel and then back. The three day event reenacts Mayan pilgrimages undertaken by the original Yucatan inhabitants. Beginning with a trip to Xcaret, pilgrims engage in rituals to honor the goddess Ixchel, in an overnight celebration. At the first rays of the sun, the canoes enter the water en route for Cuzamil. Upon arrival, more offerings are made to the goddess, and the canoes return to Playa del Carmen, on the mainland bringing the goddess’ omens of good fortune. The biggest fishing tournament of the entire year, since it takes place at what’s considered to be the height of billfish season. Tournament official, Oswaldo Pavia, reported this week that they’re expecting record breaking number of registrations. Last year’s grand prize was a Hummer, with a multitude of cars and scooters in the lower categories. This is a religious festival complete with a small fair, rides, and a craft show. Local bands and good music right on the beach. On September 15 local residents and visitors congregate around the City Hall to participate in the traditional “grito”, or cry for independence. Lead by the Mayor of Cozumel from the balcony at City Hall at 11:00 p.m., the cry “Viva Mexico” is made. Following the “grito” is an impressive fireworks display and other festivities including traditional foods as well as musical and folkloric dance performances. On September 16, Independence Day, the celebrations continue with a parade that goes through Cozumel’s downtown waterfront. Throughout the week, residents and visitors are invited to visit a fair near the City Hall that includes food stands, games, dancing and shopping. 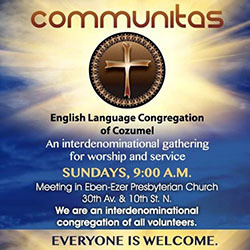 This event commemorates the patron saint of Cozumel . The celebration begins on September 21, featuring colorful processions that start from the church of San Miguel and go throughout downtown. On the last day, a fishermen carry an image of San Miguel Arcángel to the downtown pier and board a boat. The public accompanies the fisherman to the pier and board a ferry, surrounded by fishing boats, to join the procession by sea, throwing flowers into the ocean as they sail along. The day to pay respects to those that have passed on. Special altars are made with flowers, candles and food. The race serves as a qualifier for the Ironman World Championship in Kona, Hawaii. This is one of the most popular religious celebrations here in Cozumel. The celebration begins on the first day of December with a pilgrimage lead through the island, by a variety of religious and nonreligious organizations, to the church of Our Lady of Guadalupe. On December 11, adults, and children participate in a walk, or race around the island to show their devotion.